The conference will take place in the Attenborough Centre for the Creative Arts (the ACCA) at the University of Sussex, Falmer, Brighton BN1 9RE (campus map #56). Specific room information will be available on the finalised programme. The Falmer campus is conveniently located on the outskirts of Brighton on the south coast of England, close to the Channel ferry ports and to Gatwick and Heathrow international airports, and just over an hour by train (60 miles) from London. Please note most hotel accommodation is in central Brighton. The University of Sussex is located approximately five miles from the centre of Brighton. Falmer station is on the main Brighton to Eastbourne, Hastings and Lewes train lines with services running every 15 minutes in both directions during the day. The station is located on the south side of the A27 dual carriageway, with the University campus to the north. The pedestrian exit from the station is on level ground and a footpath leads downhill to the underpass with a gentle uphill walk to the University main entrance on the other side. Journeys from Falmer station to Lewes are approximately five minutes and to Brighton are approximately ten minutes. If you have luggage you may prefer to take a taxi from Brighton, Lewes or Falmer Station and be taken directly to Sussex campus. There is no taxi service at Falmer station. Local taxi firms include Brighton Streamline (01273 747474), City Cabs (01273 205205) and Lewes Taxis (01273 483232). From central Brighton or Lewes, a taxi will take approximately 20 minutes and cost around £12. Services 23, 25, 28, and 29 run from central Brighton. Numbers 28, 29, 29A, 29B and 29C travel between Brighton (Old Steine) and Lewes and stop outside the University campus. Numbers 23 and 25 run between Brighton (Churchill Square and Old Steine) and the University and come onto the campus, stopping at Falmer House (nearest to ACCA), Sussex House, twice on the North South Road, Bramber House and Brighthelm Porter’s Lodge, then Swanborough, Boiler House Hill outside the Mantell Building (board here when returning to Brighton) and finally on the Eastern Ring Road before leaving campus. Services are every 10-15 minutes Monday to Saturday daytime and every 30 minutes in the evenings up to 23:00. An hourly service follows the same route on Sundays. The University of Sussex campus is located about four miles (six kilometres) east of Brighton or three miles west of Lewes on the A27. Take the junction marked Falmer/University of Sussex (B2123) and follow signs for the University of Sussex. We advise use of the detailed campus map to easily make your way to the conference. Car parking is available on site. Car parks are marked on the campus map. There is a choice of London airports, but it would be advisable to fly to London Gatwick if possible since it is closer to the Brighton than London Heathrow or Stansted, and has better transport links to Brighton and the University campus at Falmer. By train – the easiest way from Gatwick is to take the train direct to Brighton. Trains run frequently and take 30-45 minutes. A return ticket costs from £15 depending on time of travel and if you buy your ticket in advance. The ticket vendor will provide you with train times and relevant information or you can find further details and timetables at the National Rail website. By coach – You will need to purchase a return ticket from the coach station located at either the north or south terminals. The cost of this is approximately £15 return but fares vary depending on time of day and if you book in advance. Coaches run for 24 hours, departing approximately every half an hour and taking approximately 1 hour. The ticket vendor will provide you with coach times and relevant information. The coach will drop you at Pool Valley coach station which is near the Brighton seafront. Further information and timetables can be found at National Express website. By taxi – Taxis from the airport can be expensive. If you wish to book in advance you can contact sussexchauffeurs either by telephone +44 (0) 1444 884170 or by email info@sussexchauffeurs.co.uk, website: http://www.sussexchauffeurs.co.uk/ It will cost approximately £40 one way from Gatwick to Brighton depending on the time of day. You will need to pay in advance by credit card. By coach – If you are arriving at Heathrow airport getting the bus from the airport directly to Brighton is probably the best option, especially if you have a lot of luggage. You will need to purchase a ticket from the coach station located at the central bus station at Heathrow. The cost of this is approximately £30 return but fares vary depending on the time of day and if you book if advance. Coaches run for 24 hours, departing approximately every hour. The ticket vendor will provide you with coach times and relevant information. The coach will drop you at Pool Valley coach station which is near the Brighton seafront. More information is available at National Express website. By train – After clearing passport control and baggage reclaim make your way to Heathrow Underground station. This will be clearly marked. You will need to purchase a single Underground ticket from Heathrow to London Victoria station. This should cost approximately £5. The first leg of this journey is on the Piccadilly line – please see London Tube Map: http://www.tfl.gov.uk/assets/downloads/standard-tube-map.pdf. On arrival at Green Park Underground Station you will need to change trains and board a Victoria line underground train heading Southbound. After one stop you will reach your destination – Victoria Station. On arrival at Victoria station follow the signs for Victoria Mainline Station/National Rail. Once at Victoria station you will need to purchase a train ticket from Victoria to Brighton. The cost of this is approximately £30 return but this fare varies depending on the time of day and can be cheaper if you book in advance. The ticket vendor will provide you with train times and relevant information or you can get further information and timetables from London Victoria to Brighton from the National Rail website. Please note that trains do NOT run all night – it is advisable to travel by coach if arriving at Heathrow after 9pm. By taxi – Taxis from the airport can be expensive. If you wish to book in advance you can contact sussexchauffeurs either by telephone (+44) (0) 1444 884170 or by email info@sussexchauffeurs.co.uk. It will cost approximately £80 one way from Heathrow to Brighton depending on the time of day. You will need to pay in advance by credit card. Brighton offers a wide range of hotels to suit all budgets. 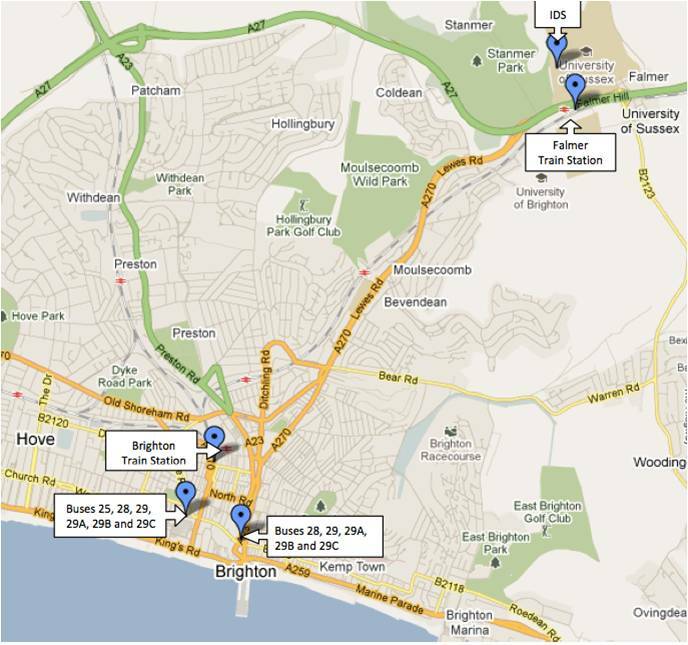 The University of Sussex maintains an approved list of hotels and guest houses in the Brighton & Hove area. All of these establishments have been visited and approved by the University Approved Hotels Working Panel and are reviewed annually. The list is available here. A selection of hotels can be found at Visit Brighton, the official Brighton tourist site, and of course, AirBnB and hostel options are available privately. If you require a taxi from the train station or coach station (Pool Valley) to your hotel they are usually available from the taxi ranks. If you need to ring for one please call Streamline Taxis 01273 747474 or City Cabs 01273 205 205. The University of Sussex is located at Falmer approximately 4 miles from the centre of Brighton. Train is easiest if you are staying near the station. Trains run regularly from Brighton station to Falmer station, and take approximately ten minutes. A return fare is approximately £4.50 per day and can be purchased on the day. For further information and timetables, see the National Rail website or the local operator Southern Rail. When you arrive at Falmer station go under the subway into Sussex University Campus. Bus may be easier if you are staying near the seafront. See above for more information.